Remember that simple, old card game called “War”? Where 2 players randomly draw cards and whoever draws highest wins the hand? For some reason I used to love that game as a kid. So much so that I played against myself on a regular basis, simply because I’d gotten my parents utterly fed up with it. Good times. Enter Martial Art, a game that uses the same basic concept but expands upon it in ways you wouldn’t expect to find in such a small package (and an even smaller one for the expansion). Martial Art (notice the pun) was successfully Kickstarted back in 2016, with designer Jonathan Ruland of Spider-Goat Games promising a fast-playing game of card battling with just the right amount of mental shenanigans and special powers spliced into the main “winner takes all” concept. And with historical Japanese artwork to boot! The idea is simple: you’re fighting over land in feudal Japan, and you’re trying to either amass 12 points’ worth of it, or gain control of 3 bridges. Each turn, a new land card to fight over is flipped, and players choose 1 card from their hand to plop down as their vanguard, followed by as many applicable support cards as they can muster. At the end of the round, each player draws a card. Are you going to play the lowly peasants with a strength of 4, or go in full force with your strength 13 Commander? Well… Do you want to win or lose? Ah, But the choice is not that simple! See, the peasants add +1 strength for each card in your hand whilst the Commander is susceptible to being taken out by an Assassin which lowers your strength to 0 if your initial strength is 10 or higher. This may seem like a lot, but all of these choices and thoughts happen within the span of a few seconds, with games seldom taking more than 5-6 minutes (at least in our experience), with fighting force value ties being broken swiftly in the old “War” tradition of pulling a random card from the deck. The lands themselves have certain (mostly minor) effects revolving around drawing and/or discarding cards that take place after the battle is over, which apply to either the victor, loser, or both. The expansion adds another layer to proceedings, with things like weather effects that put a further spanner in the works, and terrain cards that can be played before a battle takes place to influence the beginning or end of it. There are some further modifications it brings (revises a couple cards, adds new ones) as well, and its influence on the way the main game plays is felt almost instantly, or at least that’s what we took away from it after about a dozen or so plays. We’d actually recommend starting out with the expansion as the difficulty jump for the game is minimal, but the enjoyment of the concept increases exponentially with it added in. The one thing that we opted out of while playing was the tiebreaker mechanism, which works just like regular War: when two (or more) players tie, random cards are drawn from the deck, highest card wins. While I loved the idea of this all as a kid, I felt that it went a bit against the spirit of the game (especially since there’s a particular card called “Chaos” that does this exact thing), so we went with rock-paper-scissors, ⅔ for it and it worked like a charm. Of course, this was a bit of a house rule we added to further tailor the game to our needs, the mechanism itself doesn’t malfunction or anything and does carry the feel of War into Martial Art, which may well be right up your alley. I took several approaches over the many games we played, either going all in for the first few battlefields and then regrouping in order to finish strong, letting my opponent “get away” with it only to stock up on booster cards and sweep through a 3-4 pointer like Edo with ease, and all manner of in-betweens. There’s a surprising amount of versatility to the way you play and a generous helping of mind games involved, especially if you know your opponent well, as was my case. Time-wise, a game can theoretically take upwards of 10 minutes, but it rarely does so, and we kept hitting the win condition around the 6-7 minute mark once we were familiar with what the various effects on the Battlefields meant. The artwork is gorgeous, and I’ve been known to slightly lose track of turns simply shuffling through the cards in my hand just to admire the various depictions on them. The cards themselves are gorgeously illustrated, as you can see across this article, and are linen finish which means they feel great (and smell great, too, if you’re into that sort of thing), and are sturdy so you can easily play this for a long time before even thinking about resorting to sleeves. 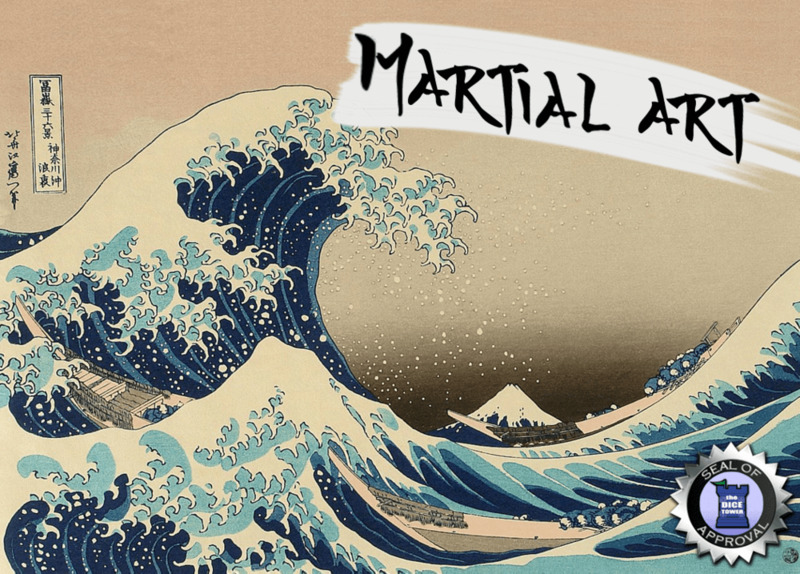 Overall, Martial Art plays fast and loose, packs an amazing amount of depth and replayability, and is fun to play no matter how involved you are in boardgaming as a whole. The Gung-Ho Geeks give this one a hearty recommendation and invite you to take part in the Kickstarter campaign hitting July 24th! And if you’d like to try the game out before that, there’s always the print and play for you to doodle with.